NASA's planet-hunting Kepler space observatory has discovered 461 new potential alien planets, boosting its total to 2,740 potential extrasolar worlds. The 461 newfound candidate exoplanets, which were announced today (Jan. 7), bring Kepler's total haul in its first 22 months of operation to 2,740 alien worlds. Only 105 have been confirmed to date, but scientists say 90 percent or so should end up being the real deal. Four of the new candidates are "super-Earths" — planets 1.25 to 2 times as big as our own — that orbit in their stars' habitable zones, a range of distances where liquid water is possible on a world's surface. One of those four is just 1.5 times the size of Earth and circles a sun-like star, researchers said. The new finds represent the latest update to the catalog of the $600 million Kepler mission, which launched in March 2009. Scientists had previously reported roughly 2,300 other candidate planets spotted during the telescope's first 16 months of operation. 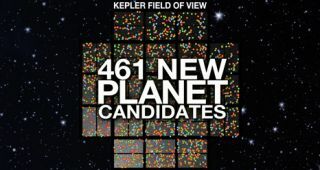 Kepler's new detections also increase the number of stars known to host more than one planet candidate from 365 to 467, researchers said. "The large number of multi-candidate systems being found by Kepler implies that a substantial fraction of exoplanets reside in flat multi-planet systems," Jack Lissauer, of NASA's Ames Research Center in Moffett Field, Calif., said in a statement. "This is consistent with what we know about our own planetary neighborhood." Kepler flags planets by noting the telltale brightness dips caused when they cross the face of, or transit, their host stars from the instrument's perspective. The telescope needs to witness three such transits to make a detection, so its early discoveries have been biased toward larger worlds in relatively tight orbits. But over time, Kepler should find more and more small planets, and more in distant orbits. The new additions to the catalog reinforce that reality, increasing the number of Earth-size and super-Earth Kepler candidates by 43 percent and 21 percent, respectively. The new detections also suggest that it's only a matter of time before astronomers detect the first true "alien Earth" — a planet the size of our own in its star's habitable zone. Another new Kepler study released today, after all, found that the Milky Way likely hosts at least 17 billion Earth-size worlds in tight orbits, while many more may circle their stars more distantly. "The analysis of increasingly longer time periods of Kepler data uncovers smaller planets in longer period orbits — orbital periods similar to Earth's," Steve Howell, Kepler mission project scientist at NASA Ames, said in a statement. "It is no longer a question of will we find a true Earth analogue, but a question of when."